In line with the #MeToo movement in Korea, there have been ongoing efforts among women here to break free of their “social corsets” either consciously or subconsciously. But not everyone feels the same, and even some of those who reject the obligation might wear occasional makeup. So it still wouldn’t hurt to know what’s new at makeup stores this fall. No woman is obliged to apply beauty products to please others, but they are still at full liberty to powder their faces however they want to, if they want to. October is the month of orange and autumn foliage -- and a drop in the mercury level. Dry and cold weather affects both the wardrobe and the vanity table. A plethora of makeup tutorials are available to explain fashion bloggers’ takes on the latest trends, but The Korea Herald took to the other end of the industry to see what the major players thought would be the in-thing for this year’s fall. The Korea Herald contacted two of the most prominent Korean beauty powerhouses, Amorepacific and LG Household & Health Care for their take. The verdict: This fall’s makeup key words are natural, matte and rose. For the face, Lee suggests a very thin layer of foundation that can still cover blemishes with a matte finish. For colors on the face, the multifunctional use of makeup products is no longer experimental. A creamy rose-shade lipstick could work as a blusher and an eyeshadow, if applied in the right amount with the right brush. Using a single product for multiple purposes can balance the colors on the face for a maximum natural look. An important tip to note is to pick a subtle color that isn’t too loud and can add natural vivacity. Amorepacific’s latest venture is various shades of “crushed rose.” The color apparently works for both cool-tone and warm-tone faces and comes in balm, liquid, matte and glossy types for this fall. As for LG Household & Healthcare, its makeup line VDL suggests dried rose, deep red and neutral beige colors, all colors of fall, with a velvety and matte texture for full lips. The deep red shade can serve as an accent against the darkening colors of fall fashion. Search results for men’s makeup on YouTube will lead to endless scrolling of videos of men around the globe who have put up makeup tutorials. 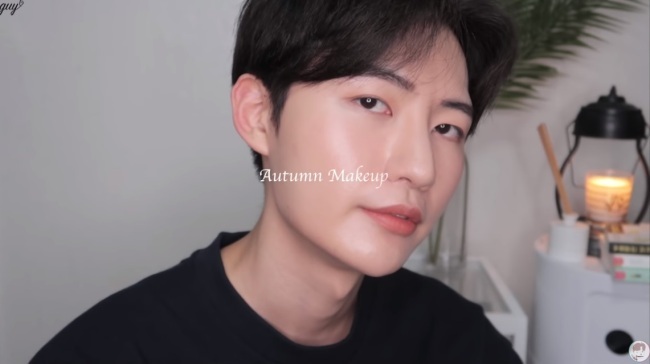 Tutorials for “natural Korean male makeup” and “K-pop idol makeup” are thriving. Korean male BeauTubers Leo J and Kim Ki-soo are now on the level of TV celebrities, and there are a truckload of people also trying to catch a break, such as Coguy, Joseph and Brute Choi. Beauty knows no gender boundaries. Male BeauTubers use ordinary products women would use, too, from moisturizers to foundation to contouring and full eye makeup. This fall, Korean men are going for calm shades of rose and smooth, flawless skin with light foundation.